On Sept. 3, the head of al-Qaida, Ayman al-Zawahiri, released a video in which he declared war on India's "kaafirs", meaning Hindus, Sikhs and Christians. Paid for by the taxpayers of Toronto. Lost in his ramblings about re-establishing an "Islamic state in the Indian subcontinent" was Zawahiri's recitation of verse 13 from the chapter titled "The Battle Array" in the Qur'an. The words were "Nasrum Min'Allah Fathun Qareeb" ("Help from Allah and an imminent victory is at hand"), a millennium-old Islamic battle prayer in which Muslims believe Allah has guaranteed success to Muslims in their fight against the "kaafir" or infidel. What many Canadians don't know is that these same words have been painted as a mural in the heart of Toronto's Little India and stare down at the so-called "kaafirs". I wrote about it last year. The beautiful calligraphy is in Arabic, a language few non-Arabs and non-Muslims read or understand. The mural was paid for by the taxpayers of Toronto. To understand the jihadi significance of the words on this mural, it's useful to go to places where jihadi terrorists are fighting Islamic wars — as ISIS is. On Oct. 10, 2013 when the al-Qaida affiliate in Syria, Jabhat al-Nusra, defeated the Syrian army and captured the capital city of Daraa province, the local commander, Abu Abd al-Malik, boasted it was Allah himself that had in the Qur'an guaranteed al-Qaida's victory, as he recited the same verse inscribed on Toronto's mural. Reciting the same battle prayer Zawahiri had invoked, al-Malik said, "Allah himself has guaranteed success to Muslims in their fight against the infidel." Last year, Toronto realtor Salim Ahmad, a Muslim and a member of the Muslim Canadian Congress, launched a petition, asking the mayor and city officials to remove the mural containing the jihadi battle prayer. 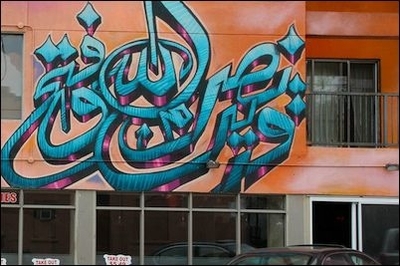 The city declined to take action after investigating and concluding the words contained in the mural have a wide variety of interpretations in Islam, many of which are not war like. An Islamic academic at the University of Toronto, said the mural contained a prayer that is often used by ordinary Muslims when facing difficulties in life. Others disagree, including the medieval Islamic scholar, Ibn Katheer, the 14th century Islamic authority, whose exegesis of the Qur'an is widely accepted as the most authentic. Ibn Katheer wrote, "Help from Allah (is near) and a speedy victory (is assured)" in the chapter titled "The Battle Array", tells Muslims if they are willing to sacrifice their lives and possessions in the service of Allah, not only will they find Paradise after death, but the conquest they desire over their enemy will be theirs very soon, after they confront that enemy. After the al-Qaida leader invoked the same Islamic battle cry against India's Hindus and Sikhs earlier this month, Ahmad re-launched his petition, this time addressing mayoral candidates John Tory, Doug Ford and Olivia Chow, asking them if they will remove the mural if elected. "Not one of them even acknowledged receiving my message," Ahmad told me.